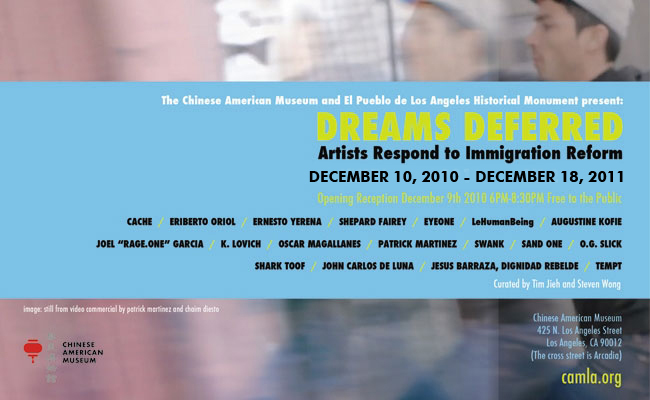 The Chinese American Museum (CAM) and El Pueblo de Los Angeles Historical Monument is proud to present Dreams Deferred: Artists Respond to Immigration Reform opening on December 10, 2010. This exhibition will showcase local artists exploring the tensions, repercussions, hopes, and dreams of immigrant communities in the face of new immigration legislation, through a broad spectrum of art including street art, graffiti art, sculptures, painting and multimedia installations. U.S. immigration laws have long reflected a lasting legacy of racial exclusion starting with the 1882 Chinese Exclusion Act, the first legislation to restrict immigration based on race and ethnicity. This legacy of immigration legislation targeting immigrant communities has since reemerged in the recent decades with California’s Proposition 187,and Arizona’s Senate Bill 1070, as attempts at inhibiting the livelihoods of undocumented immigrants. Dreams Deferred continues the current national dialogue about immigration, kicked-off by the recent opening of CAM’s Remembering Angel Island, an exhibition commemorating the 100th year anniversary of the opening of the West Coast’s first immigration station. Both exhibitions will serve to shed light on the parallels of past and current immigration policies and reform, and how Los Angeles’ diverse immigrant communities collectively share not only their immigrant histories, but also many of the challenges facing new immigrant communities today. The immigration debate usually focuses on Latino communities but the reality is more complex. A number of Muslim-American organizations also are collaborating with Latino and other immigration groups to work on issues of mutual interest and need..The for example recently joined the Interfaith Immigration Coalition in the fight for comprehensive immigration reform.